Of all the places we've stayed along the Pacific Coast Highway, the Franciscan Inn in Santa Barbara was one of our favorites. And it's hard to say exactly why. It wasn't the most luxurious, although it's certainly very comfortable. It doesn't have a fancy restaurant – in fact it doesn't have any kind of restaurant. Its breakfasts are fabulous, though, brought in by the lovely Carol, an outside caterer who sets up shop in the guest lounge and serves incredibly light croissants, bread from local bakeries, and some of the best muffins we've ever tasted: cinnamon with maple syrup frosting, the morning we were there. Some of the other guests were obviously regulars, asking Carol how she was doing and telling us (it's a friendly place) that they always stayed here when they came to Santa Barbara. Perhaps it was just the look of the place, as we felt good about it before we'd even checked in. 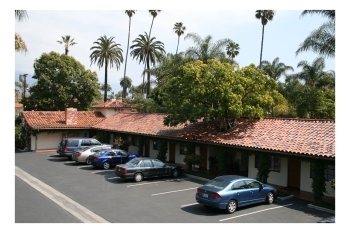 It's a lovely 1920s Spanish-style building, typical of Santa Barbara, that used to be a ranch but has been stylishly and sympathetically converted into a motel-style Inn. The owners have kept the history and atmosphere, but made the Inn an unpretentious and welcoming home from home. There were several different people manned the check-in desk during our stay, and we peppered them with questions about Santa Barbara. We have to say that every single one of them was friendly, helpful, and knowledgeable about the town. Nothing was too much trouble for them, and their good humor helped to make for a very friendly visit. We were in room 174 (above), on the upper floor of the motel-style Inn. It was light and bright, with two huge beds, acres of space, and no noise at all from either neighbors or the street. 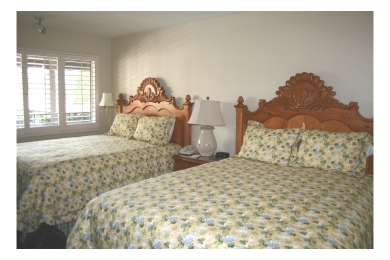 The Inn is in a quiet residential neighborhood, but only one block from the beach and a few blocks from Stearns Wharf and the main State Street. As well as the complimentary parking, the Inn offers free wireless internet to guests, free local phone calls, cable TV with HBO, complimentary breakfast, and has a free movie library if you just want to stay in and relax in your room – or keep the kids entertained. There's also a small spa and a year-round heated outdoor pool. 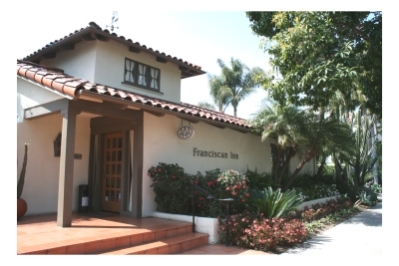 The Franciscan Inn is easy to find if you're driving the Pacific Coast Highway, in either direction. Directions are on their website, but basically you just head for the ocean and one block back from the seafront along Bath you find the Inn. There's plenty of free parking. And if you're taking the train it's walking distance from the Santa Barbara Amtrak station.